Let's pretend that Islam has nothing to do with terrorism. What is being done to convince Muslims like Abdirahman S. Mohamud that Islam is a religion of peace? The current strategy (politicians and the media saying over and over that Islam is peaceful) clearly isn't working. So what's the new plan? Eliminate poverty? But that's not going to happen. So are we stuck with terrorism forever? 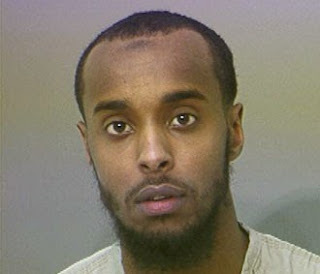 Columbus, Ohio-A Columbus man has been indicted on charges that he allegedly helped terrorists. According to court documents filed with the Franklin County Clerk of Courts, 23-year-old Abdirahman S. Mohamud, whose last known address was 3762 Dunlane Court, was charged with soliciting or providing support for an act of terrorism, and money laundering in support of terrorism. Mohamud allegedly provided material support and resources, or electronic devices to persons engaged in terrorism in the Middle East, and had traveled that area. The investigation into Mohamud was conducted by the FBI over and year and a half. “Honesty is the best policy” this age old traditional saying is disrespected by liberal media and President Obama by diverting Quranic teaching to kill non-Muslims, and to blame this crime to illiteracy, unemployment and social injustice to Muslims by non-Muslims. This false blame to illiteracy, unemployment is nothing but waste of time and creates opportunity for ISIS to be more powerful in future. History won’t forgive them who misled the situation. Quran is cancerous cell, no matter how many people of world believe it as a good cell, good for human mind, body and souls. Muslims are bound to say that it is their holy duty to obey the command of their Allah. Quran is believed to be words of their Allah. If their Allah says to kill non-Muslims, Christians and Jews, Muslims must follow to be good Muslims to live with their Allah after their death. It is different story to say that Muslims are living in dark world and knowingly carrying order of evil to destroy God’s creation. Muslims must know that wages of sin is death, means burning of their souls in Hell fire for eternity after their death along with who misguided these acts of terror against humanity.